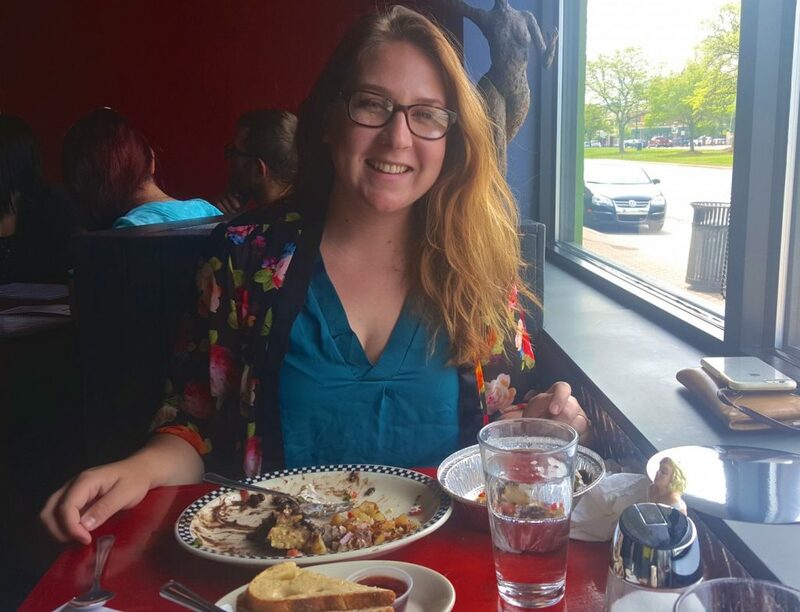 It was great to get out for breakfast with Kelly Stickrod, who is a very recent grad from Cranbrook’s Architecture department – I saw her work at the grad show out at Cranbrook a few weeks ago, and was interested to hear more about her perspective and her process. 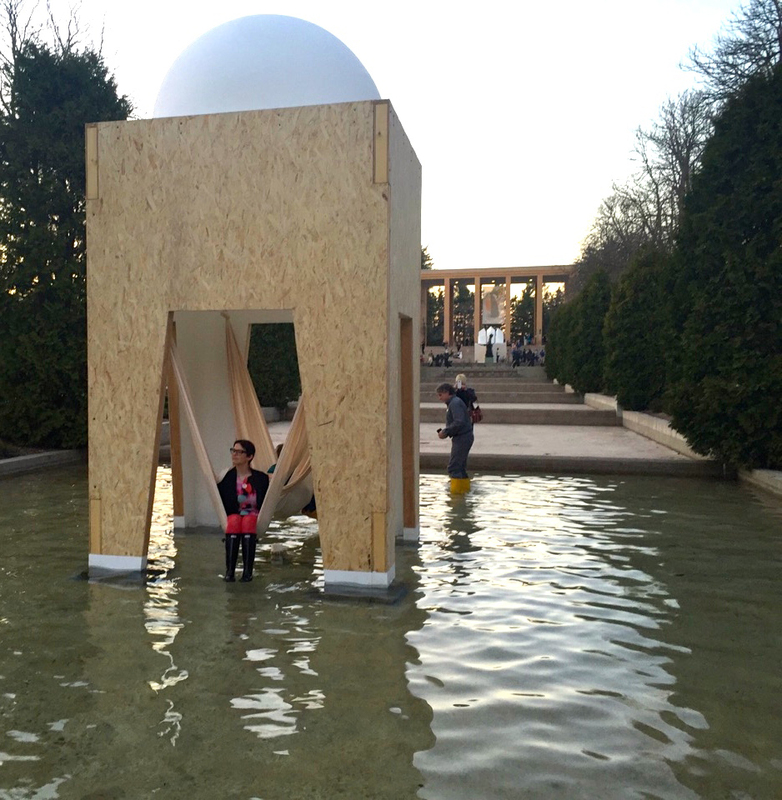 Kelly installed her final project inside one of the reflecting pools, and you had to wade out to it in pairs of rubber boots that she provided. It was a fun way of thinking about asking an audience to engage with space – something that is perhaps a conditional luxury for other types of artists, but an absolutely necessary consideration in architecture. I was also happy to get to talk to Kelly because I’m in the midst of drafting a longer-form article about the MFA experience, and the impact it has on the life and career of an artist. It was timely to be sitting down with someone who is right on the precipice of jumping from the structure of a grad program into the unknown – reminds me that this is a brave and risky endeavor. I guess sooner or later we all have to learn how to fly, but it feels dicey to me to try taking flight with the weight of all that debt. Just one more way that artists demonstrate freakish, possibly detrimental dedication to their practice. Kelly definitely had some pushback when she decided to take a Masters, instead of seeking a job on the strength of her undergrad degree in architecture, but there is much evidence of how it has broadened her thinking and her practice – and not just within the context of her discipline. “I’m more aware now of social structures and privilege,” she says. “When people talk about gentrification as though it’s 100% positive, it feels narrow-minded.” Unless you lead a completely siloed existence out at Cranbrook, it is difficult to remain untouched by the wild disparity in resources and infrastructure between Detroit city proper and its affluent metro suburbs, and artists in particular occupy a strange interstitial space within places of abject poverty, carving out an often-meager existence for themselves by bringing place-making foundation money into areas whose residents may not ultimately benefit from the influx of development. Architecture, because of its capacity to shape social behavior, has even more power to affect place – think about the difference between a park with a gazebo in its center versus one with a wall running through the center. But there are some systemic blind spots within the discipline. “Architects always present things in hyper-idealized terms,” said Kelly. She points to architectural drawings and models, which always show things in a form that is unrealistic or impossible – interior spaces without ductwork, facility layouts that do not include parking lots. You see this a lot in the wider world of miniatures – dollhouses often lack a specific bathroom, preferring to present an idealized picture where no one uses the bathroom. In the case of architecture, however, the real-world implications of too idealized a vision can be costly. Some of the most aesthetically admired structures, such as the work of Frank Lloyd Wright, are structurally flawed and extremely tenuous to maintain. Certain miscalculations in social behavior can leave giant sections of deactivated space, like palazzos where no one hangs out, or present actual danger, like kinetic sculptures that distract people driving on freeways. There is also, perhaps, a more quietly insidious side to architecture. As the designs for Detroit at this year’s Venice Architecture Biennale are set to be revealed, there is a question about what, exactly, imagineering of this nature offers the existing city population. When we hail the power of architectural vision to shape the future, it’s important that we also remember its potential power to exclude, to impose, to displace. I’m glad to see that one of the newest members of the field, at least, is a kind and thoughtful person. She’ll be teaching a K-8 architecture program at Cranbrook’s summer camp this season, and plotting her next move. I, for one, am excited to see what kind of future Kelly Stickrod is going to build!